Activities available at Bear River Migratory Bird Refuge include wildlife observation, wildlife photography, environmental education and interpretation, hunting and fishing. Family-Friendly Atomosphere… Great Food & Fun for Everyone! Wednesday & Thursday are mixed & men’s Leagues if wanting to join contact BR Bowling Center for new start up dates. Lane Reservation Policy – You may call ahead & reserve your lanes for your group. You must arrive within 5 minutes of the stated time or your lanes will be given away (reservations recommended on the weekends). Hours for the bowling center are: Monday & Tuesdays 4:00 p.m. – 9:00 p.m., Fridays 4:00 p.m. – 10:00 p.m., and Saturdays 11:00 a.m. – 10:00 p.m. They are located at 1410 West Main Street in Tremonton for more information call 435-257-1997. The museum is to learn, preserve, exhibit and teach history of the Bear River Valley by collecting stories and artifacts of Northern Utah and displaying them in a historical setting. We also honor residents from the valley who have passed away. helping the community remember their contributions to the community. The museum is located at 11 East Main St. Tremonton. They are ppen Monday-Fri 2 P.M. to 5 P.M.
Brigham City Self Directed Historic Site Tour – 18 sites and buildings are on this self-directed historical site tour. The Historic Brigham City Depot is an active historic museum in process of complete restoration to the original 1906 grandeur. Its role is to preserve, promote, protect, and maintain the depot and its history. The Depot offers revolving historic exhibits and special events for holidays. Visit the gift shop Mon, Thurs, Fri, and Sat 1-5 PM. Special hours and tours by appointment. Closed January 1 to May 1. Brigham City museum hosts a permanent community history display. They also host travelling exhibits throughout the year. Swim Lessons, water aerobics, lap swimming and plyometric training are available Monday through Thursday from June 6th to August 26th. Please contact the pool at 435-734-0991 for times and dates. The pool is ADA accessible and has a special “family” change area for those needing it. In an escape room, people are locked in a room and they have a specified amount of time to get out. At CLUE Inn Escape, our time is 60 minutes to escape. During that time, the participant has to find different clues, puzzles, and enigmas in order to find the key to get out of the room. Doesn’t sound too hard right? Well, it can be, I’m not talking about puzzles like crosswords or word searches or even the traditional puzzle. I am talking about puzzles that make you think outside the box, puzzles that encourage teamwork. Escape rooms have many different puzzles and locks, in the current room at CLUE Inn Escape, we have 14 locks that need to be figured out before the 60 minutes runs out. Escape rooms are good for just about anything like; date night, girls night, double dates, prom dates, corporate team building, birthdays, holidays, or anything you can think of when you want to just have fun. CLUE Inn Escape offers a hands-on approach to team building. Our escape room allows employers the ability to assess the following characteristics of an effective team. Effective teams encompass the following skills: Communication – effective teams must know how to communicate with each other. Common Goal – Effective teams must be committed to a common goal. Ideas – Effective teams encourage new ideas from others. Diversity – Effective teams appreciate the diversity of other team members and feel open to express different opinions, ideas, and suggestions. Creative – Effective teams must be creative and unafraid to share opinions and suggestions. Leadership – Effective teams know that the leadership of the team will change from time to time. The natural hot spring ranges in temperature from 120 – 134°F (51°C – 57°C) and contains the highest mineral content (46,000 mg/L) found in any hot spring in the World. In 5 minutes 8,400 gallons of hot spring water surfaces. In a 24 hour period there are 900,000 lbs worth of minerals carried to the surface with 2.4 million gallons of hot water. This hot spring water is coming from 8,000 feet below the earth’s surface and is estimated to be around 22,000 years old. Less than 50 feet from the natural hot spring there is a cold spring which 65°F – 75°F (18°C – 24°C). The cold spring has a slightly higher rate of flow, every 5 minutes 9,200 gallons of water surface. In a 24 hour period, 2.6 million gallons of cold water surface. These two springs surfacing this close to each other are the second closest hot and cold spring in the world. Crystal Hot Springs offers 3 mineral hot tubs, large soaker pool and an Olympic size pool. Beautiful 18 hole golf course with pro shop and snack bar. Visit their website to reserve tee times and fees. Everything from bowling and mini golf, to Birthday parties, company parties and league bowling. The Fine Arts Center is a non-profit organization dedicated to promoting and providing affordable fine arts opportunities for youth and families in the community. They offer after school and evening classes in art, youth choir, theater, drawing, puppetry, and photography. 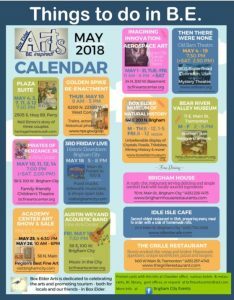 They also offer a variety of community activities including: periodic community youth arts activities, theater productions, puppet story time for preschoolers, monthly concerts, a Puppet Museum with special family activity times, puppetry workshops in the schools, monthly Open Mic Nights. The Fine Arts Center also houses the World of Puppetry Museum. Come see an eye-catching array of over 150 puppets from around the world (15 different countries) as they celebrate creativity and the ingenuity of people from a variety of world cultures. Also included are puppets that represent their own American favorites from movies and stories. Open the 1st & 3rd Saturday of the month 1- 4 pm. The most popular attractions include stepping out to the site where history was made, viewing the site’s replica steam locomotives, participating in historic re-enactments of the famous completion ceremony, and exploring the nearly 150 year-old railroad grade on the auto tours and hiking trail. Whether you are coming out to check out the visitor center, see a film, or enjoy the unique landscape you should be able to connect with some of the unique aspects of this pivotal moment in our nation’s history. The Driving of the Last Spike is reenacted during the summer season allowing visitors to relive this celebration. Volunteers portray the dignitaries who were at the ceremony on May 10th, 1869. Reenactments are held Saturdays and holidays, starting the first of May through mid-September, at 11:00 a.m. and following the 1:00 p.m. Steam Demonstration. For fees and operating hours please visit their website. Heritage Community Theatre is a 208 seat community theatre that presents seven productions each year. They perform on Friday, Saturday, and Monday nights with some matinees. Check website for current production and tickets. Main Street Playhouse was started in October of 2013. It was founded by JuDean Parkinson in cooperation with the Bear River Valley Museum. When the Museum was looking for fund raising ideas and JuDean was looking for a venue for her theater company the two came together to create the Main Street Playhouse. They want to provide an experience for the audience and the performers that they wouldn’t necessarily see or perform at a traditional community theater. It is also our mission to always create a family friendly atmosphere appropriate for all ages. It was Christmas in 1998 that The Old Barn Community Theatre first opened its doors. The very first production was “The Best Christmas Pageant Ever”. Now it has been 15 years since that first show. For 15 wonderful years, and in 72 unique productions, talented individuals, too numerous to count, have donated energy, time and financial assistance to this incredible project. In that time they have taken their audience to the Midwest prairies and to the Austrian Alps. They have traveled along the Yellow Brick Road and up the Mississippi River. They have flown with Peter, danced with Cinderella and played the trumpet with a band of boys. They have experienced the intensity of a jury room and the laughter of a beauty parlor. They’ve traveled to ancient Egypt, the tunnels of New York, and to places and lands of pure imagination. They have spent time in lonesome mountain cabins, enchanted castles and in homes seeing real life at work . They have looked at families, both rich and poor, laughed with them and cried with them. They have sung the songs of Disney, laughed at the stories of Dr. Seuss and felt the joy as Scrooge redeems himself. On their stage they have danced in the rain, sung in the snow, and bounced in their seats as they were taken back in time with music from days gone by. The 9-hole “Skyway” course at the Skyway Golf & Country Club facility in Tremonton, Utah features 2,836 yards of golf from the longest tees for a par of 34 . The course rating is 32.9 and it has a slope rating of 103 on Blue grass. Locals have celebrated the bounty of produce harvested between Brigham City and South Willard in Box Elder County for well over a century, but it wasn’t until 2006 that the state of Utah designated the area north of South Willard on Highway 89 as the “Utah Fruitway.” Fruit season stars in July and lasts into the beginning October. With over 40 varieties of peaches grown along the way you are sure to find something you love. Boat, swim, water ski, and fish on the warm waters of Willard Bay. Camp under tall cottonwood trees that frame the night sky. During winter months, Willard Bay is a wildlife watching area for nesting eagles. Two areas, North and South Marinas, offer all the amenities for a weekend at the Bay. To reserve campsites and to see fee schedule please visit their website.